Salt Lake City, Utah: The University of Utah Press, 2001. This is the first paperback edition of Tony Hillerman's Navajoland: Hideouts, Haunts, & Havens in the Joe Leaphorn & Jim Chee Mysteries by Laurance D. Linford. 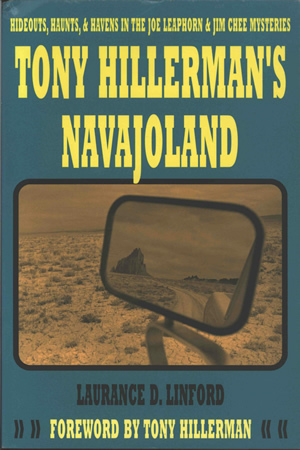 Tony Hillerman wrote the foreword for this book, which was published in 2001 by The University of Utah Press. The front cover background is teal, and features the book's title and "Foreward by Tony Hillerman" printed in yellow. The author's name is printed in black below a sepia photograph by Doug Dykeman of a rear view mirror reflecting the Shiprock. The landscape behind the mirror is desert, with scattered clumps of grass between large areas of bare ground. The back cover background is also teal, and the title of the book is printed at the top in yellow. Black text describes the book's contents and an orange rounded rectangle advertises Linford's book Navajo Places. Binding: Paper covers. On the spine, the book title is printed in yellow and the author's last name in black, above the colophon and the word "UTAH."